It is estimated that three-and-a-half million South Africans (about 6% of the population), reported in 2012, suffer from diabetes and there are many more who remain undiagnosed1. For many people it may come as a surprise that a possible complication of diabetes is gum disease2. Research shows that there is an increased prevalence of gum disease among those with diabetes, with serious gum disease being added to the list of other complications associated with diabetes, such as heart disease, stroke and kidney disease2. Diabetes can affect a person’s ability to fight bacteria in their mouth as the high blood sugar encourages bacteria to grow, which can contribute to gum disease3. Signs of gum disease can include but are not limited to gums that are red, sore, bleeding, or swollen, loose teeth and chronic bad breath3. Emerging research has found that the relationship between severe gum disease and diabetes may be two-way. Diabetics are more susceptible to serious gum disease, and serious gum disease can potentially affect blood glucose control which can contribute to the progression of diabetes2. In fact, well-controlled diabetes can help to keep your mouth healthy and keeping your mouth healthy can help you manage your blood sugar, since infections can cause your blood sugar to rise, making your diabetes harder to control3. 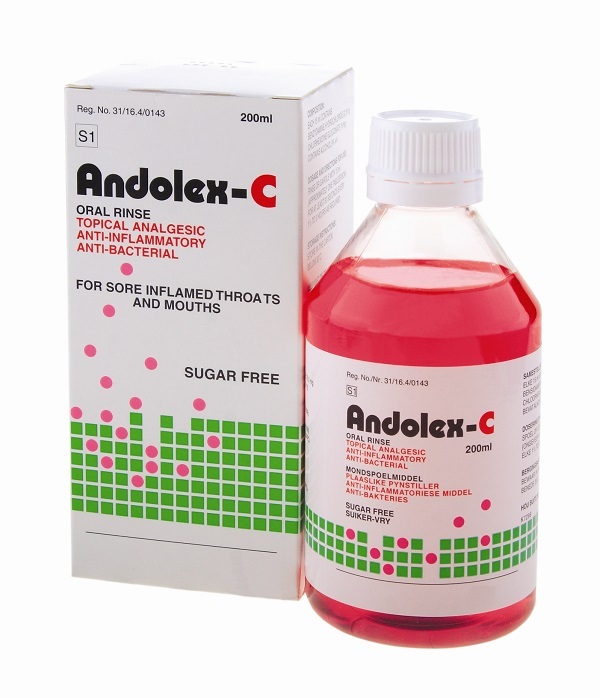 Andolex-C Oral Rinse provides effective relief for patients suffering from the symptoms of gingivitis or gum disease such as bleeding, red, or swollen gums4-9. It has a 4-in-1 effect providing anti-inflammatory, analgesic, local anaesthetic and antiseptic effects 4,6. Good oral hygiene is important for everyone especially those with diabetes. Good oral hygiene includes bushing twice a day, flossing, and using an anti-bacterial mouthwash. This not only freshens breath and gets rid of debris in the mouth, but it also helps to prevent gum disease and plaque buildup3. Andolex-C Antibacterial Mouthwash can be used to help kill the bacteria that produces plaque, and in doing so prevent conditions like gingivitis and periodontitis7, 8. It is suitable for use as a gargle from 6 years old and comes in an aniseed and peppermint flavour. The dosage recommendations include rinsing with 10ml twice a day for no longer than 10 days without consulting with a healthcare professional. The same steps that can help to keep your mouth healthy can also help manage your diabetes. These steps include eating a healthy diet, not smoking, taking your diabetes medications and seeing your dentist at least twice a year3. Go to www.andolex.co.za for more information. Kolliyavar B, Shettar L, Thakur S. Chlorhexidine: The Gold Standard Mouth Wash. J Pharm Biomed Sci. DOI: http://dx.org/10.20936/jpbms/160205. Van Strydonck DAC, Slot DE, Van der Velden U, Van der Weijden F. Effect of a chlorhexidine mouthrinse on plaque, gingival inflammation and staining in gingivitis patients: a systematic review. J Clin Periodontol 2012;39:1042–1055.